We have a Christmas surprise for you this year, open it! Download 0.7.2 - Christmas special now! It comes with a much more colorful server browser, demo marker indicators in the menus, a console option to use raw mouse inputs (inp_grab, now reverted to 0.6 by default), a surprise from Santa Tee and lots of fixes. 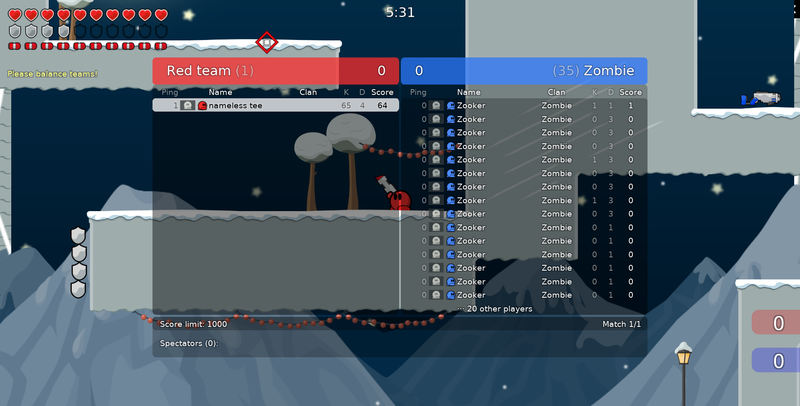 The Player and Tee ingame menus were also restored, so you can now select a different skin ingame, although it will only take effect after a reconnect. A complete list of fixes can be found on the detailed changelog. Die Devs hauen ja derzeitig ganz schön was raus. Bei der Geschwindigkeit sind wir in einem halben Jahr bei 0.8.0.
released du das dann irgendwann closed oder open source?